In another great guest review here on Crime Watch, today Sarah Gumbley (pictured right) takes a closer look at LIGHT THICKENS, the 32nd and final Inspector Alleyn novel, which was originally published in 1982, the year of Dame Ngaio Marsh's death. Sarah is an Auckland based book reviewer, who reads a lot of literary fiction, biographies, and other non-fiction works, as well as enjoying some crime and thriler fiction. She has also reviewed for Good Reading, NZLawyer, and Scoop Review of Books in the past. Sarah has also set up her own excellent and growing books-related website, Literatlas, which aims to encourage readers around the globe to value books and their impact on the world. You can visit her site here and its Facebook page here. The postponement of the Ngaio Marsh Award (which will now be held later in the year) at least has given me a little extra time to fit in another review from the Diamond Anniversary Collection of Marsh’s works. So I chewed my way through LIGHT THICKENS, also one of the Inspector Alleyn mysteries. Just like PHOTO-FINISH it makes use of her experience in the theatre, but in this tale, the scene is set in London, where Marsh also spent a number of years. Peregrine Jay is a theatre director and owner of London’s famed Dolphin Theatre. He decides that for his latest production he will put on Shakespeare’s tragedy, Macbeth. Jay successfully auditions a collection of great actors for the parts, even including theatre great, Sir Dougal Macdougal as Macbeth himself. He’s also got the brilliant Margaret Mannering as Lady Macbeth, and child prodigy William Smith as the son of MacDuff. Dress rehearsals all run well, and soon enough, they’re all ready for their opening night. Pleasingly, there’s at least one Kiwi in the book. Rangi plays one of the witches, and even introduces the haka into his performance. Then, six weeks in, disaster strikes. A key actor is murdered during the performance. As it happens, Inspector Alleyn is sitting in the audience that night, and so ends up leading the investigation into who committed the crime, and how. He is of course, assisted by his Scotland Yard colleagues, Detective Inspector Fox, and Detective Sergeants Thompson and Bailey. By the time I was halfway through the story and no murder had been committed, I was starting to wonder if one was going to happen in time to be solved before the end of the book. But the tension was certainly in the air, and something terrible seemed inevitable. In the end, the killer wasn’t who I had been so certain it would be. I got a surprise when it was revealed in the last few pages. But I suppose that’s how it should be. Marsh is too good to ever be predictable. 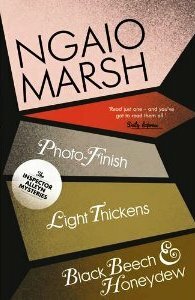 As Sarah mentioned, you can now buy LIGHT THICKENS as part of a very reasonably-priced three-book set (along with PHOTO FINISH, the penultimate Alleyn tale, and BLACK BEECH AND HONEYDEW, Dame Ngaio's autobiography) of reissued Marsh classics. This latest Ngaio Marsh collection was released late last year and early this year, in celebration of both 75 years since the first Alleyn tale, and sixty years since the 'Marsh Million', when I understand Marsh became one of only four authors of the time to have one million of her novels released onto the market in a single day. The Ngaio Marsh collection volumes (11 in total, containing the 32 Alleyn novels and the autobiography) seem like a great way to collect a few Ngaio Marsh tales. So, what do you think of Sarah's review? Do you like the Guest Reviews addition to Crime Watch? Do you like the sound of LIGHT THICKENS? Does Golden Age crime writing (even if it was written in the 1980s) appeal? What is your favourite Ngaio Marsh tale? Thoughts and comments welcome. The link to Sarah Gumbley's site is not working. I keep getting an error message when I click on _here_. Yes, it seems Sarah revamped her site, and that broke the link. I've replaced it with the new (working) link. So it seems. I guess she will unavailable for a few days until the remodeling is finished. The case is finally solved as a result of the young playmates of William's selection of toy soldiers to act out the parts, helping Alleyn to identify who did and how it was done. You'll have to read this well-crafted story to find out, but I can tell you this - BEWARE THE POWER OF THE CLAIDHEAMH-MOR!